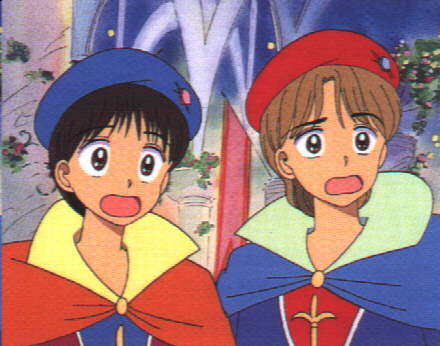 ... which turns out to be on a bet with his cousin in the magical world (who happens to look just like Daichi...). Later, Erika gives Himechan another magical devide, which allows her to split into two Himechans at once. Click on the above images to view them in full. 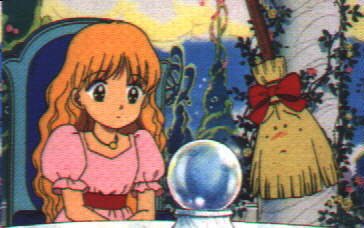 And if you like Himechan no Ribbon, you might want to check out Mahou Tsukai Tai, Komodo no Omocha, and Chou Kuseninariou! as well. Himechan no Ribbon is an excellent shoujo series based on the manga by Mizusawa Megumi. Its main character, Nonohara Himeko, is especially well done. Himeko, or Himechan, is very normal, as shoujo heroines go (and, for that matter, anime characters in general ^_-). Himechan is in Junior high school and is the middle child of three sisters. She has always greatly admired her elder sister, Aiko, whom she considers to be the ideal girl--Aiko is graceful, beautiful, polite, and talented at cooking, sewing, and the like. Her younger sister, Yumeko, is a bit more like Himechan, and is also quite a bit younger (Yumeko is in early elementary school or kindergarten). 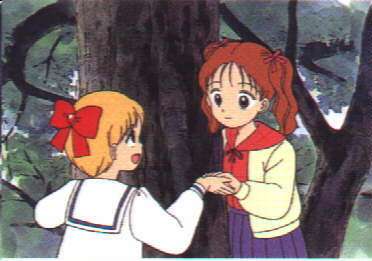 The story begins as Himechan is given a magical ribbon by Princess Erika from the magical world. (By the way, Himeko's name means 'little princess.' Coincedence? I think not. ^_-). People in the magical world have 'twins' in the human world--i.e. people who look exactly like them (which explains why Sei's cousin is identical to Daichi). 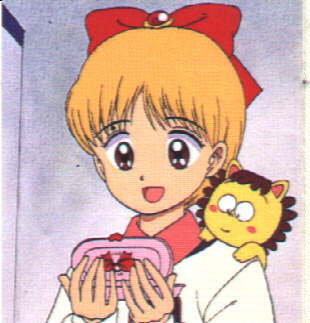 Himechan is Erika's twin in the human world which was why she was chosen to be the recipient of the ribbon. In order to qualify for the throne of the magical world, Erika must create something useful and have her twin in the human world try it out for a year to prove that it is indeed useful. Thus, Erika, visits Himechan and explains this to her. 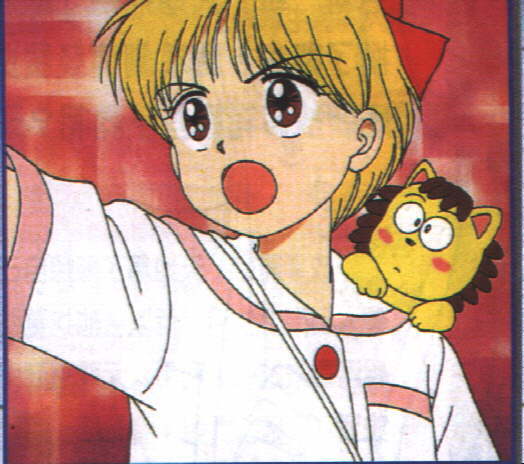 As part of the experiment, Himechan is also given a companion--her favourite toy, Pokota (the stuffed lion that appears at the top of this page). Pokota comes to life when Himechan is wearing the ribbon and acts as her advisor and confident. Other characters soon show up and the series doesn't wind down for a moment. The storyline is superb and the characters are very well developed. 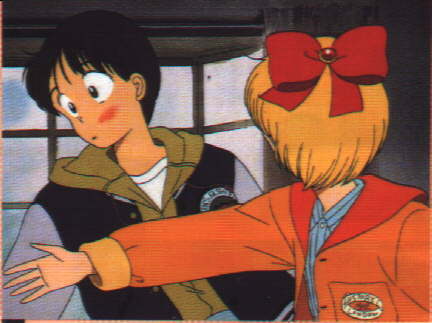 As is common with shoujo series, the main character matures and develops, but in Himechan no Ribbon, it seems that the whole cast grows along with her. You can see the changes that slowly take place in all of them as the series progresses. 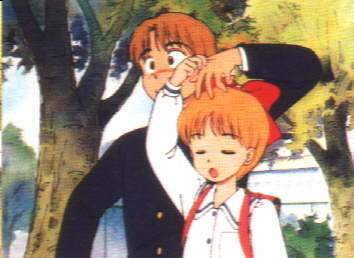 Himechan no Ribbon is a very funny, very touching, and very interesting series, all of which making it very addictive. (Just ask my friends. Ohohoho...). Currently there are 13 volumes of the anime that have been subtitled by Tomodachi (I have the first ten and am getting 11-13) and the manga series runs for eight volumes. This is KASHA's page for Himechan. Nice images, link, and more. An excellent comprehensive Himechan page! The images on this page were also provided courtesy of this page. Also a really good Himechan page! Lots of great info and links to translations for the manga as well as her own manga scans. He also has fan art on his main page. The usual comprehensive Hitoshi Doi page. Well, that's all for now. Comments and suggestions for this page are always appreciated so please email me. This page and its design are ©1998, The Temple of the Blue Dragon. You are free to link this page; however, plagarism of it is punishable by a sharp whack on the head with a staff and successive flying kicks, courtesy of one Nonohara Himeko.